Kinesiology is the study of human movement, sport and physical activity. 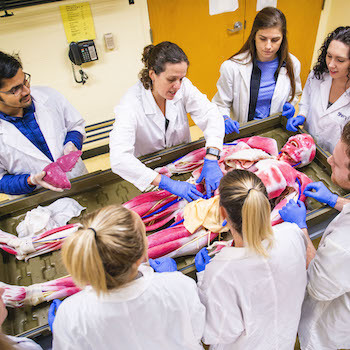 Our multidisciplinary Bachelor of Kinesiology (BKin) program analyzes physical movement through the integrative perspectives of psychology, motor control, sociology, biomechanics, history, physiology, health and philosophy. Our Kinesiology program limits first-year enrolment to ensure year one class sizes are smaller, providing opportunities for more engagement and instructor interaction. The multidisciplinary and integrated approach to kinesiology our program adopts exposes you to a wide range of topics, lenses and ultimately career paths related to human movement, with the opportunity for you to individualize your BKin degree through the selection of electives, concentrations and minors. Our Kinesiology facilities include teaching and research laboratories in exercise physiology, anatomy/physiology, biomechanics, health and motor learning and control, as well as the use of world-class athletic facilities for physical activity tutorials. One of 3M Functions, 3U Functions & Relations, or any 4U Mathematics at 60%. If students would like to pursue science electives at Laurier, we recommend Chemistry and/or Physics. Biology and English are calculated in admission average.